Willbros Construction in George West, Rock Water Energy Solutions in Alice, and Cameron International in Corpus Christi sent employees to Coastal Bend College recently for oil and gas industry basic orientation. The course was taught by Terry Kirkpatrick, a safety trainer and consultant with over 23 years of experience in the industry. 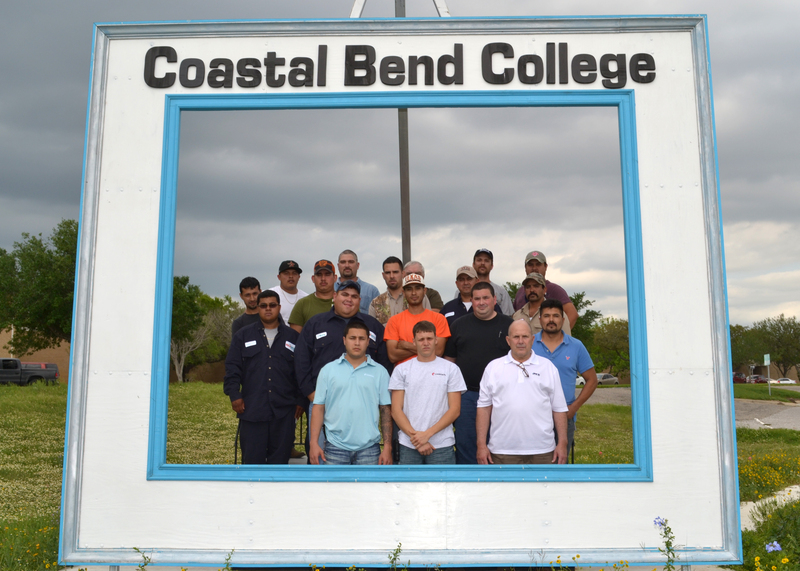 Safety training for the oil and gas industry was recently held at Coastal Bend College in Beeville. Including in the training were, from left, Andrew Hernandez of Houston, Juan Hernandez of Corpus Christi, Wayne Petri of Marshall, Neil Croch of Houston, Raul Benevides of Rio Grande City, Eddie Banuelos of Mission, Samuel Garza of Rio Grande City, Artemil Salinas of Rio Grande City, Rueben Hernandez of Alice, Cruz Perez of Alice, Erasmos Marines of Eagle Pass, Joe Martinez of Alice, Joe Martinez of Austin, Doug McVey of Beeville, Alejandro Rodriguez of Alamo, Dennis Cardona of Corpus Christi, Cory Hendrix of Corpus Christi and Safeland basic instructor Terry Kirkpatrick. Kirkpatrick as a safety trainer increases the availability of training and also makes it possible to do on-site training throughout the Eagle Ford Shale region. He is a qualified OSHA compliance inspector and works with oil and gas companies on managing employee training. His instruction is primarily awareness training, however in-depth and customized training is also available through the college’s continuing education program. Those who receive training through Coastal Bend College will have access to transcripts that document their professional development and certifications. In addition to earning a credential card that states that they have been trained in “SafeLand Basic Orentation,” participants will have a permanent record at the college. The training included Willbros Construction employees: Andrew Hernandez, Juan Hernandez, Wayne Petri, Neil Croch, Raul Benevides, Eddie Banuelos, Samuel Garza of Rio Grande City, Artemil Salinas; Rock Water Energy Solutions new employees: Rueben Hernandez, Cruz Perez, Erasmos Marines, Joe Martinez, Joe Martinez, Doug McVey, Alejandro Rodriguez; and Cameron International employees: Dennis Cardona, and Cory Hendrix. For more information about the professional development in the oil and gas industry, go to www.coastalbend.edu/ce or call Glynis Holm Strause at (361) 354-2447.